As I mentioned earlier this week, I've been thinking about getting Wylla out a little more, so I dug out her leash and harness and took her out for a stroll. It was a little windy, and the sky was spitting a tiny bit of rain, so it wasn't the best day be out, but we did get a little walk in. Here's a small clip from our outing. I guess I knew it wasn't going to work, but we've had so much fun taking Wylla out for walks, I thought I would try to harness up Charlene, and see what happened. I had fantasies of Wylla and Charlene walking side by side down the sidewalks of Tacoma wearing matching harness and leash sets. 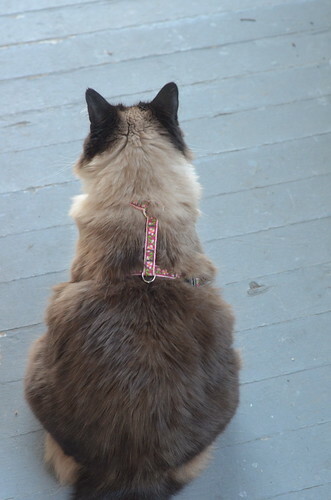 Years ago, when she was just a teen, I bought a harness for Charlene. We tried putting it on her a few times years ago, but never with success. The harness is adjustable, so after a little tweaking, I was able to make it fit our full-grown Bean. I slipped her into it, and snapped the buckles. 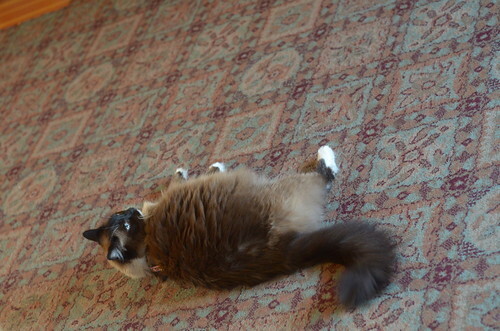 Once it was on, she flopped a very dramatic flop on the living room rug. After a few minutes, and with some encouragement, I managed to get her on the front porch. And I attempted to snap on the leash. Once the leash was on, it all became a game. And our walk went no further than the welcome mat. I so remember that post because of the person who said her husband described it as "taking her cat for a drag". I still laugh out loud at that one. Not sure what is cuter? Wylla's floofy neck or her magnificent pantaloon. Oh wait - "paws were raised" ala Charlene wins! 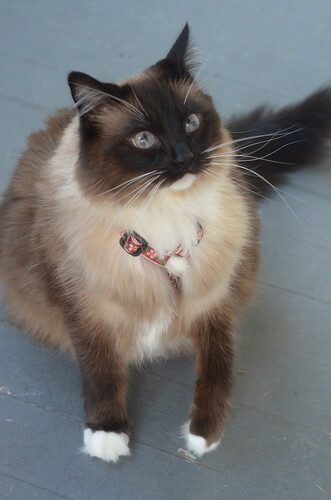 We bought a leash with the idea of walking my plump cat. It serves well to immobilize him. He does the some flop/cannot move act. Charlene's expression was all OH NO YOU DID'NT!!! And Wee-ish Wylla's ears never stopped swiveling. I wonder if her nose was just as busy? Her nose is ALWAYS busy. Civil disobedience cat shall not be moved! What kind of harness do you use? I've recently had to confine my indoor/outdoor Kingsley when he started crossing the street. He's a reformed stray missing the wind in his fur and grass between his paws. 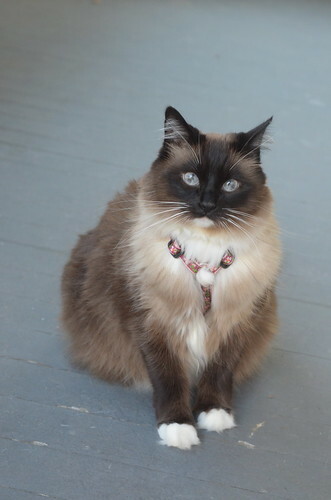 Wylla's harness is made by "Kitty Come With Me" and widely available. We tried a few, and this seems to be comfortable and secure. No can do can Mum. Haha, it's important to be clear on what you will and won't do, isn't it Charlene? Looks like a Lupine harness, made here in NH. 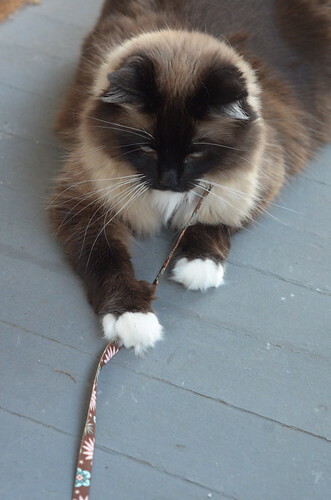 I have the same one which I have tried on my cats. 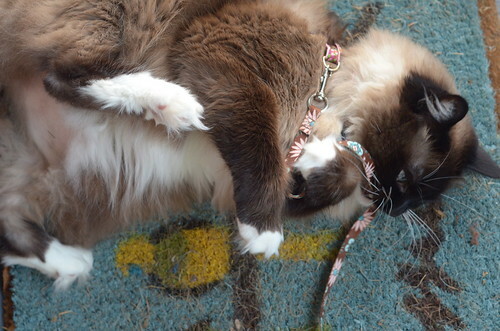 I've only had one who loved walking on a leash, he thought it was great fun. The others have Charlene's reaction. What brand of harness is Charlene wearing? I don't know! I purchased it almost ten ago!